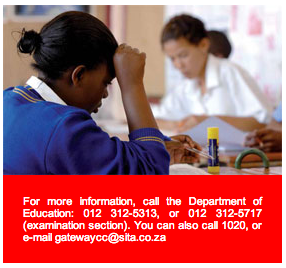 Grade 12 learners all over South Africa have started to prepare for their matric exams. This year's matric learners are the first group to write their exams under the new curriculum and who will be awarded the new National Senior Certificate. All learners in schools, from Grade R to Grade 12, are now learning under the outcomes based National Curriculum Statement. This year marks the first year that all learners in South Africa are on the same national school curriculum. 2008 completed the cycle of changes that was started in 1998. Teaching for matrics will continue until the end of October, leaving learners and teachers with more time for revision. The Department of Education said it hoped this would improve the pass rate for 2008. Last year, the national pass rate for Grade 12 was 65, 2 per cent. This was below the 2006 pass rate by 1,4 per cent. In line with the new curriculum, exams in all the provinces are now set at a national level. This ensures that the exams are on the same standard. Mathematics or Maths Literacy, as well as Life Orientation are now compulsory subjects. The majority of Grade 12 learners in this academic year have registered for maths and science subjects. It is the largest number ever registered for maths and science in Grade 12.